This aircraft was flown by Lieutenant Quentin Roosevelt, 95th Aero Squadron, when he scored his only victory, 10 July 1918. Four days later he was shot down in this aircraft. The front view is of a standard factory aircraft. 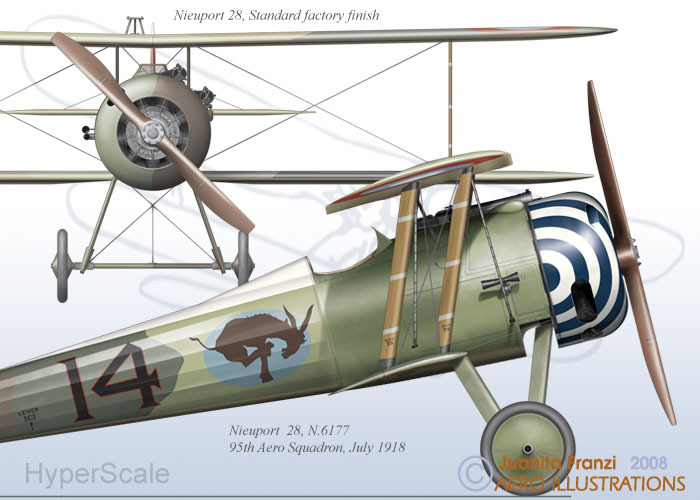 These drawings were prepared for a soon to be released book: ‘The Nieuport 28 America's First Fighter’by Theodore Hamady (Schiffer Publishing). The book comprehensively covers the development of the Nieuport 28, its WW1 combat history and its post war service.